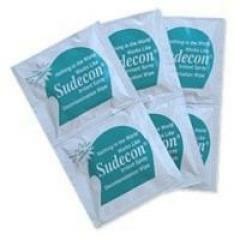 Fox Labs SUD-1000 Sudecon Decontaminate Wipes (1000 Count) FREE SHIPPING! The patented formula in Sudecon® works faster andmore consistently to clean up individuals exposed to OC, CS and CN than any other decontamination product ever formulated! It strips the chemical agents from the skin instantly and takes away the 'burn' and opens the eyes in just 7 to 15 minutes-or less! ©2002-2019 CopsPlus.com: Fox Labs SUD-1000 Sudecon Decontaminate Wipes (1000 Count) FREE SHIPPING!